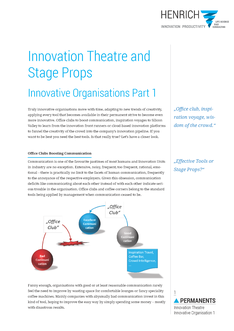 Hundreds of Newsletters are published around Innovation every day. Hundreds of sources, distributing „News“ which will be „Olds“ just a couple of hours later, to be replaced by „Newer-News“. Reflexion not expected, just consume as much as possible. Not a trend worth to follow. Therefore „PERMANENTS“ focus on topics which have been hot for some time, which are still hot right now and which are likely to be hot in the foreseeable future. Topics beyond the Newsletter-Mainstream. For inspiration, reflection. Not for the quick scan but for the quiet read. Existing PERMANENTs can be downloaded in a PDF format from this page. New PERMANENTs will be published first on this page. Just have a look from time to time. Please note: For compliance reasons with the General Data Protection Regulation/GDPR (German: Datenschutz-Grundverordnung/DSGVO), a subscription of the newsletter is not possible. 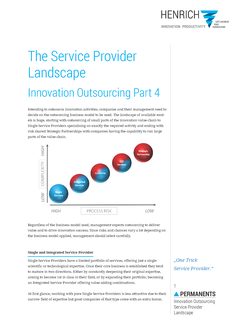 Significant parts of the innovation value chain are outsourced to service providers and the proportion of those external activities has constantly grown over the last decades. 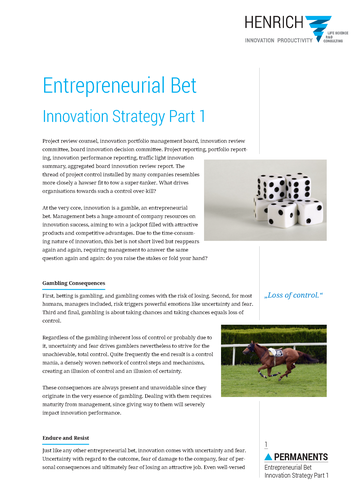 While most managers are fully aware of this trend, not all of them contemplate the consequence – outsourcing has a tremendous leverage on innovation success. 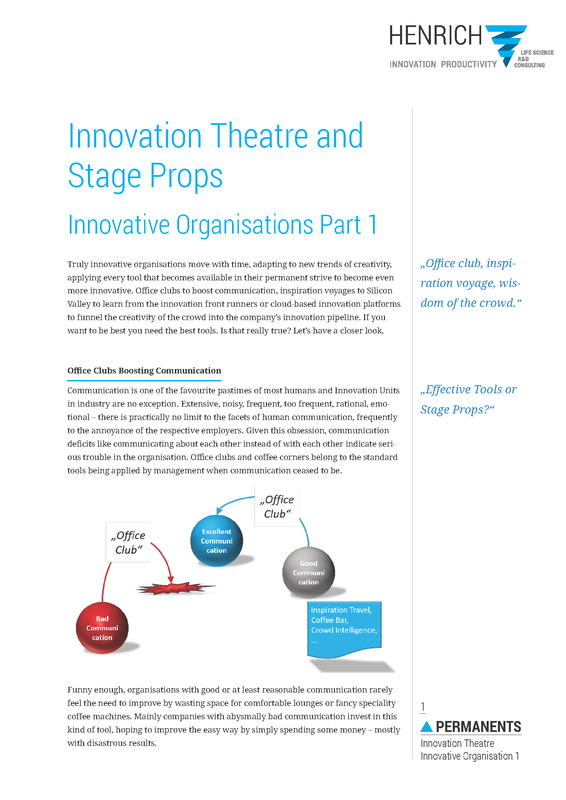 Routine business processes like Innovation Outsourcing could be expected to run smoothly and close to the peak of operational performance but real-life leaves much to be desired. 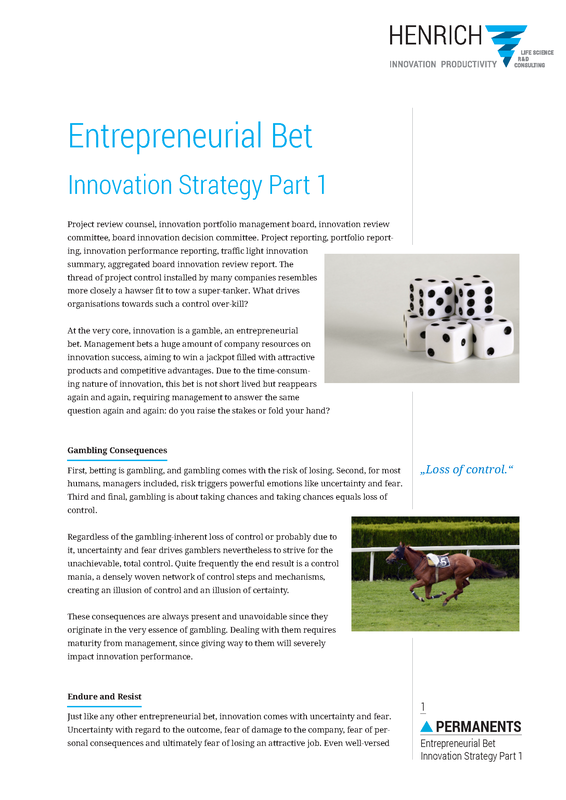 Seen from management perspective, innovation is an entrepreneurial bet, gambling substantial business resources on successful innovation and requiring consecutive decisions whether to quit the bet or to continue and raise the stakes. 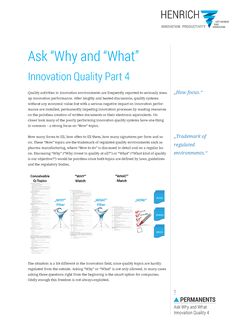 No CEO or Managing Director would deny the relevance of quality for innovation processes. Few of them, however, feel the need to get directly involved in this topic. An attitude that bears the risk of costly failure. 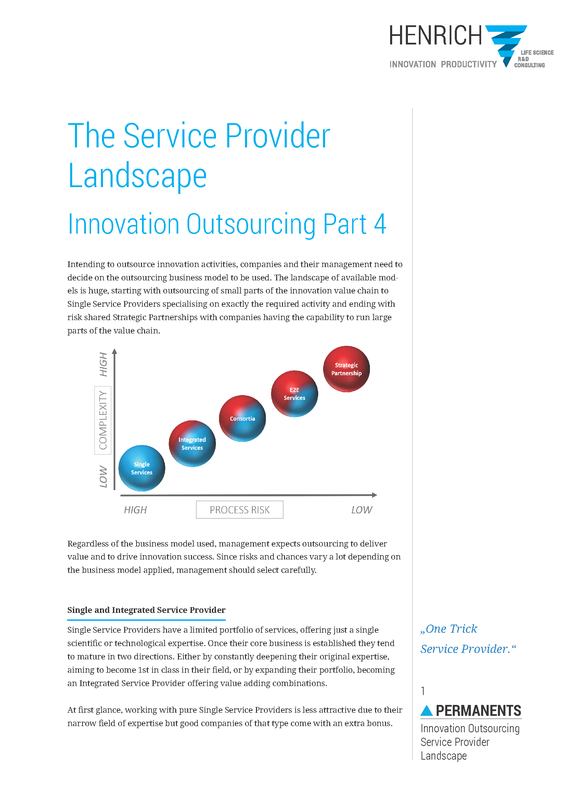 Driven by the growing investments in the field, innovation outsourcing has been more and more transformed to a sourcing driven “Lowest-Bidder” approach. 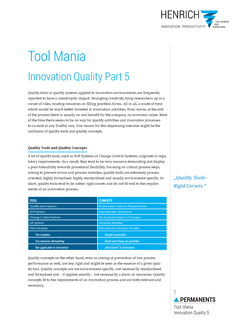 Quality rules, regulations and activities are a common and costly occurrence in the manufacturing field. Compared to that, the industry’s investment in quality activities in the innovation field is small to non-existent. häufig einen überwiegend touristischen Charakter. Kosten astronomisch, unternehmerischer Nutzen mikroskopisch. Equipment qualification is a regular occurrence in facilities operating under GMP or GLP regulations. Many drug discovery units consider the concept to be far less attractive and tend to avoid qualification activities. The worlds most famous app looks like it has been designed by a dedicated Zen Buddhist with a serious creativity deficit. Seen from a Discworld point of view, narrative has been confused with Narrativium. The powerful story – “understanding DNA will explain diseases and this will lead to improved diagnosis and preventive medicine” – strongly influenced the course of events and was expected to produce a happy ending. Low reproducibility rates within life science research undermine cumulative knowledge production and contribute to both delays and costs of therapeutic drug development. GLP and GMP are inevitably linked to the pharmaceutical industry. Well, not to the complete industry. The exception is the discovery part of the business, balking at the very idea of GLP in research and painting dark pictures of pointless regulations smothering creativity. Nearshoring is about avoiding all the offshoring drawbacks while going for true cost saving. The initial costs, e.g. daily rates, may not be competitive with Asian service providers but the Total Costs of Activity (TCA) are. 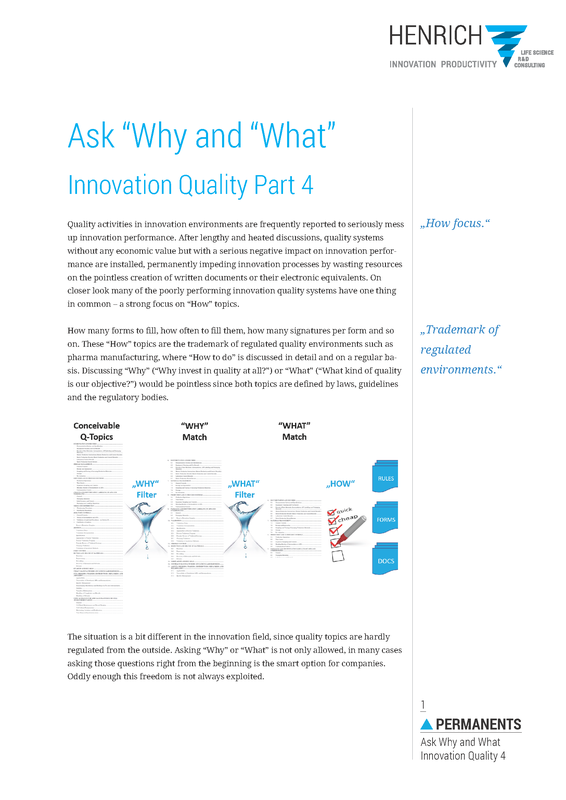 Arguing with a QA manager is like wrestling with a pig in mud. After a while you realise the pig enjoys it.